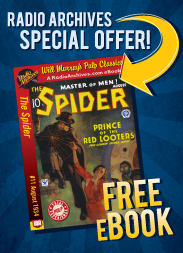 Never before had a shrewd criminal leader so successfully defied the Law — and the Spider’s sure vengeance! A powerful Eastern murder syndicate, employing two deadly weapons, held America for ransom, spreading pain and terror and red destruction... Never had the Spider’s struggle against the Underworld seemed so futile, for the name of Richard Wentworth was disgraced, his fortune was forfeit, and his beloved had betrayed him into the hands of the police — and certain death! He was the champion of oppressed humanity, its shield and protector against the murderous outbreaks of the Underworld; wherever crime struck terribly, that way he hastened, taking up the challenge. The police had offered rewards totaling thousands of dollars for his capture “dead or alive.” And the Underworld hated him, and plotted his destruction with a fierceness bred of abject terror. One man against more than a hundred pirates, of course, a hundred killers. The Spider knew that, but it did not check the wild impulse to laughter that squeezed his lungs. It was no wonder that men call the Spider mad! Nick Santa Maria reads this exciting suspense story of murder, mayhem and mystery that perfectly evokes 1936 Manhattan. Slaves of the Murder Syndicate originally published in The Spider magazine, February, 1936. Chapter 4: Murder Gone Mad! Chapter 8: Rendezvous With Death! Chapter 9: The Spider Finds His Foe! Chapter 14: Four Men Who Die! Chapter 15: A Life for a Life! Chapter 16: Enter the Spider!